Every year, the New England Sports Network, better known as NESN, releases a fan vote where fans of the Boston Bruins can vote for who they think should be awarded with the annual 7th Player Award. The 7th Player Award is awarded to the Boston Bruin who “has performed above and beyond expectations”. In years past, the team honour is handed out at the end of March, so the countdown is on for the winner. Before we get into who should win the award for the 2018-19 season, let’s take a quick look at the past winners of the last decade. Information regarding this is courtesy of Ice Hockey Fandom.com. Brad Marchand, David Pastrnak, and Charlie McAvoy are the most recent winners of the award and for good reason. Marchand exploded three years ago with a 37 goals and a new career-high in points with 61. David Pastrnak also had a great year when he won it back in 2016-17, scoring 34-36-70 numbers from his 26 the year prior. Finally, last year, Charlie McAvoy scored 32 points in his debut NHL season and truly came out as one of the best young offensive d-men in the league. In the past, the award has been handed out at the end of March, just ahead of the Stanley Cup Playoffs in April. We are already over a week into the third month of the new calendar year, so now is the perfect time to take a look at some of the players who can with the 2018-19 7th Player Award. When Anton Khudobin did not agree to a new contract with the Boston Bruins following the 2017-18 season, the concern came as to who the Bruins were going to fall on for the role of the backup goaltender position. Ideas of younger, prospect goaltenders from either the Providence Bruins or other affiliate teams were thrown around, but it was the free-agent market that would provide the solution for this new-found problem. Boston signed journeyman goaltender Jaroslav Halak to a two-year contract with an annual average salary of $2.75 million. Last season, Halak finished up his fourth season with the New York Islanders, the fourth NHL team of his 13-year career. Halak finished last season with a 20-26-6 record, a 3.19 GAA, and a .908 save percentage – not great numbers. Lucky for Bruins fans and himself, Halak turned a new leaf while wearing the Spoked-B sweater and is showing glimpses of top-level play, the type of play that we saw from him during his time with the Montreal Canadiens. Early on this season, starting goaltender Tuukka Rask was not on his game. He was struggling in net and was losing more often than he was winning. However, Jaro Halak made an appearance and took over the show in the meantime, keeping the Bruins afloat in the NHL’s Eastern Conference playoff race. Head Coach Bruce Cassidy mentioned the fact that he may look to split the number of games that Rask and Halak play down the final stretch and that shows that Halak has done enough to earn starts when it matters. When the original signing was made, many people, including myself was not a fan mainly due to his performance in the previous season but he has exceeded everyone’s expectations and should be a favourite for the 7th Player Award because, without him, Boston may not be second in the Atlantic division. Chris Wagner never once scored ten goals in his five-year NHL career. In fact, he never scored more than 15 points in a single season, a mark he once hit in 64 games with the Anaheim Ducks last year in 2017-18. When the Bruins signed Wagner, the Walpole, Massachusetts native to a two-year deal on the opening day of free agency, the signing of Joakim Nordstrom and the hope that the young, up-and-coming players within the Bruins organization will get more NHL minutes, it seemed like Wagner was going to be a spare tire – a depth piece for injuries or for a replacement for a player who is struggling but no, Wagner has become a near-permanent member of the 2018-19 Bruins. Part of the reason for his success is the help of his linemates, Sean Kuraly and Noel Acciari, who have helped bolster the game of Wagner to a level never seen before in the NHL. The trio has brought a high level of intensity and energy to the bottom-six while being able to add in a few goals here and there. Additionally, Wagner leads the Bruins with 226 hits, a stat that ties him for 6th most in the National Hockey League. In today’s NHL, all four lines of any team need to have the ability to score goals when they are so required to do so, yet provide a level of physicality and defence that can keep them in the thick of things. Chris Wagner has been a big reason for the success of that line and he deserves to be in the conversation for the 7th Player Award. No one expected the performance of Wagner to be this solid and a brief stroll in past Twitter comments will highlight that. Without a doubt, David Krejci is one of the best second-line centres in the NHL and is one of the best playmakers in the league for the past few seasons. It may seem hard for a player of that stature to win an award that presents the player that has exceeded expectations, but he needs to be in the conversation. Since putting up 17-46-63 numbers in the 2015-2016 campaign, Krejci seemed to be on a decline for point production. In 2016-17, Krejci scored 54 points in a full 82-game season followed by a 44-point year last year in only 64 games played. However, with the growing chemistry with left-winger Jake DeBrusk, Krejci is on pace for just over 71 points this season. That total would be the second-highest single-season point total for Krejci since his 22-51-73 effort back in 2008-09 – ten seasons ago. In that 2008-09 season, Krejci averaged 0.89 points-per-game. In comparison, Krejci is averaging 0.87 points-per-game, the third-highest PPG average in his 13-year NHL career. Krejci has found 15 of his points on the man-advantage, meaning the bulk of his numbers have come from five-on-five play, a huge attribute to take into consideration. Throughout the past few seasons, the Sternberk, Czechoslovakia (now the Czech Republic) native has been on the receiving end of hard criticism but quite clearly, he has used that as motivation for his success this season. The 32-year-old has three game-winning goals this season, including the overtime goal in the 4-3 victory over the Carolina Hurricanes on March 5th. Linemate Jake DeBrusk said the following about his chemistry with Krejci right after the game versus Carolina. David Krejci exceeded the expectations that were placed on him back in September before the puck dropped to begin the regular season. His name is back in the minds of teams across the league if they so happened to forget about him and he has been a factor for the success of the Bruins. Sean Kuraly joins linemate Chris Wagner on this four-player list because, in a way, they have to be. Kuraly and Wagner, with the inclusion of Acciari, have surprised most Bruins fans and hockey fans throughout the league with their energy, tenacity, and offensive capabilities while throwing in the occasional hit or fight. Sean Kuraly came to Boston on June 30th, 2015 in a trade with the San Jose Sharks that sent goaltender Martin Jones off to California and Kuraly with a 2016 1st Rounder (Trent Frederic) to Boston. Martin Jones was acquired by the B’s from the L.A. Kings in exchange for beloved Bruin, Milan Lucic only a few days prior. Kuraly didn’t play with Boston until 2016-17, skating in eight games, scoring a single point. Kuraly was given an opportunity in the 2017 Eastern Conference Quarter-Finals against the Ottawa Senators and he earned his way into the hearts of Bruins fans all over with two massive goals, one of which in the second overtime session in Game 5 of that series, forcing a Game 6. After that remarkable game for Kuraly, he ended up playing 75 games during the 2017-18 season, scoring six goals and eight assists for a total of 14 points. In the offseason of this past year, Kuraly signed on the dotted line to a three-year, $3,825,000 contract extension, securing himself a position on the NHL roster for the time being. Kuraly has done that and more. The Dublin, Ohio, USA native has matched his career-high in goals (6) and set a new career-high in points (17) and has played in twelve less games than in last year’s season. The threat of the fourth-line could be courtesy of the always hard-working Sean Kuraly. Kuraly still possesses that clutch goal-scoring talent, scoring two game-winning goals so far in 2018-19 – both coming in back-to-back games against the Sabres on December 29th and the Blackhawks in the Winter Classic on January 1st. 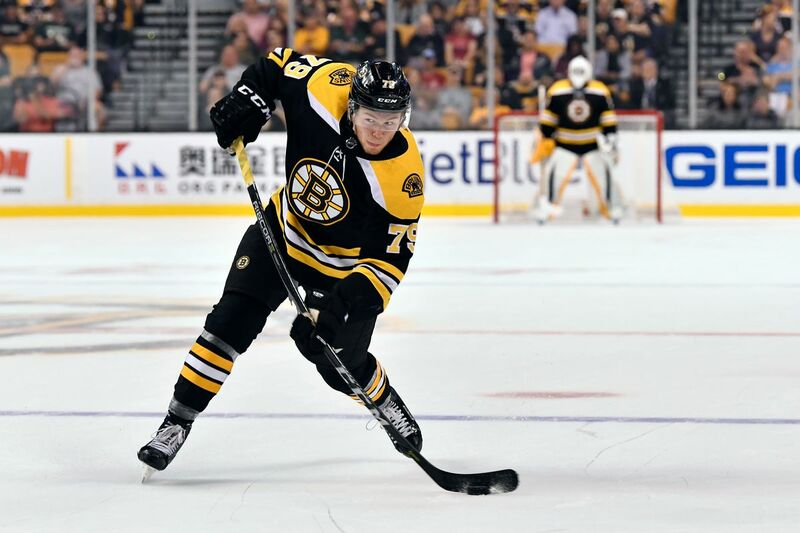 Kuraly has been one of those quite but deadly pieces to the puzzle that is the 2018-19 Boston Bruins – which can come across as a pleasant surprise for him, the management, and the fanbase. It seems like when the Bruins are down a goal late in the hockey game, scrambling to find their legs and score the tying goal or even the winning goal, Chris Wagner is inadvertently in the thick of things when the goal eventually crosses the red line. Wagner has scored the game-tying goal on three different occasions, two of which in the third and final period. Also, in each of those games where he scored the tying marker, the Bruins went on to either win the game or lose in a shootout. I’ll be 110% honest here – I was fully anticipating Chris Wagner to be scratched for more games than he played and to see limited ice time when he is indeed in the lineup. Losing out on Tavares and Kovalchuk in free agency, at the time, it appeared as though Sweeney and the rest of the B’s management staff had no one else and wanted to go for depth. Tim Schaller, the now Vancouver Canuck, did not re-sign, but it looked like Nordstrom would replace him. Instead, the Bruins have a physical, gritty fourth-liner that has been big when scoring meaningful goals this season. Chris Wagner is my personal pick to win this year’s 7th Player Award, who do you think wins the annual accolade? Was it one of the players I listed or does another player come to mind? Let me know via Twitter (@tkdmaxbjj) or on FaceBook comments! Side Note: In the poll above, I listed D Brandon Carlo as an option, yet he is not on my list. I personally expected Carlo to be good this year, so he did not necessarily ‘exceed’ my expectations, but he has been great. Check out the available tickets from our advertising partner SeatGiant for your next Boston Bruins game. Click the link below, and when purchasing any event ticket, from the NHL, NBA, MLB, NFL to concerts and shows, please use discount code BNGP to save a little money. Thank You! Brad Marchand has been with the Bruins organization since the 2009-2010 season, following being drafted 71st overall (3rd round) in the 2006 NHL Entry Draft. In that time, Marchand has not always been the point-producing scorer that we happen to know him as today. Marchand started his career in the National Hockey League with only one point in twenty games during the ’09/’10 campaign but returned the following season with twenty-one goals and forty-one points in 77 regular season games. In his first six seasons, Marchand never amassed more than fifty-five points in a season, a mark that he reached back in 2011-12. Within the 377 regular season games from 2009 to the end of the 2014-15 season, Marchand scored 116 goals and 112 assists for 228 points – not bad, but something that seems odd considering what Marchand has been doing for Boston in the past four seasons. Even at the time, it seemed like Marchand was capable of more because of his performance in the 2011 Stanley Cup Playoffs, helping the B’s hoist the Stanley Cup with 11-9-19 numbers – including two goals in Game 7 of the Finals against the Vancouver Canucks. For Brad Marchand, the offence truly started to click 2015-16. The Halifax, Nova Scotia, Canada native scored thirty-seven goals that season and a lot of that could be attributed to his chemistry with Patrice Bergeron that had been growing strong over the previous seasons. Bergeron, even to this day, is one of the biggest reasons for the success of Brad Marchand. Following that 37-24-61 year, Marchand entered the contract negotiation phase of career. Back in September of 2012, Marchand signed a four-year, $18 million contract worth $4,500,000 per season. With one year remaining, Marchand agreed to an eight-year, $49 million deal worth $6,125,000 every season until 2024-2025. Taking a look back on that deal, I and many other hockey fans feel that he could have very well demanded into the eight million range on the skill alone, but the age factor and the love of Boston persuaded him to take a little bit of a pay cut. Right after signing the contract, Marchand went on to explode for eighty-five points on the final year of the previous contract, proving to all the naysayers that he deserves that long-term commitment. The 2016-17 season was so good for him, that he made it into his first career NHL All-Star Game. The question came up of course though, could he continue that success into the future years or was it a one-time sort of event to hit that point mark? Well last season, Marchand answered that question by matching that exact point total. While he failed to meet the goal total, Marchand tallied six more assists than the year prior, mainly due to the emergence of young superstar David Pastrnak on the Bruins first-line. It is also fair to note, however, that Marchand scored 34-51-85 numbers in only 68 games. That takes us to this season – the 2018-19 season. Brad Marchand started off the year on a slower pace than in the years prior but that could largely be because of the skill increase of Czech forward David Pastrnak. Pastrnak took the league by storm with his shooting capabilities and the scoring of Marchand kind of went under the radar by other NHL franchises, at least, the fanbases forgot about him. With that said, Marchand is currently on pace for another career season. After sixty-four games, Marchy is averaging 1.19 points-per-game, currently the second-highest average of his career, behind last year’s effort. Marchand has only missed one game, leaving him the chance to hit 81 games played and with that 1.19 PPG average, Marchand can reach the 94-point mark and become the first Bruin since Marc Savard in 2006-07 (96) to hit ninety points in a single season. Of course, Brad would have to finish off the season on this pace and avoid missing anymore time from injuries or suspensions. Even then, for him to hit a new career-high of 86 points, he would have to score ten points in the next eighteen games – very possible for Marchand. Even if he fails to break or even match his personal point record, the fact that he has been able to consistently help the Boston Bruins win games and play well, then that is a win in my books and I’m sure, in a lot of your books as well. On Saturday, Marchand played in his 666th career NHL regular season game, entering the contest with a combined total of 666 penalty minutes. Who did he happen to be playing against – the New Jersey Devils. I’ll let you put the pieces together from there. Regardless, Brad Marchand is on pace for a career season and without that, the Bruins may not be on a sixteen-game point streak and ahead of the Toronto Maple Leafs. From here on out to the Stanley Cup Playoffs, we can only hope that Marchand’s season continues to build steam. Marchand and the Bruins look to extend the point streak to seventeen games Tuesday night against the Carolina Hurricanes in the TD Garden in Boston, Massachusetts. The Boston Bruins have taken the Eastern Conference by storm in the past few weeks, earning a point in their last fifteen games and did not lose a single regulation game in the entire month of February. The Bruins’ recent hot-streak has given them a three-point lead on the Toronto Maple Leafs for second in the Atlantic division. With the loss of Taylor Hall (knee surgery), the chances of the New Jersey Devils making the Stanley Cup Playoffs have decreased to the point where it’s hard to see them making a push. Having lost two games in a row, the Devils are seventeen points out of the playoffs right now with a 25-32-8 record for 58 points so far. Tuukka Rask has been lights out for the Bruins and it may be part of the reason for the upgraded level of confidence and in turn, success for Boston lately. Rask only faced twenty-one shots against the best team in the NHL, the Tampa Bay Lightning, but he stopped all but one and looked pretty solid on those few shots. Rask has a point in each of his last sixteen starts. Damon Severson is by far the best Devils defenceman right now, coming off of a 1-2-3 night in the loss to the Philadelphia Flyers last night. The 24-year-old, Melville, Saskatchewan, Canada native has 9-24-33 numbers in sixty-five games for New Jersey this season. David Krejci has had a solid year this season, finding chemistry with young forward Jake DeBrusk and more recently, trade deadline acquisition, Marcus Johansson on the Bruins second line. Krejci has 15-40-55 totals in 64 games in 2018-19 and has six points in his last five, including a three-assist night in the win against San Jose on February 18th. 33-year-old Travis Zajac has already surpassed his point totals from last season, but he has struggled this year on the defensive side of the puck. In his last four games, Zajac has one point and a combined -6 rating, averaging just around nineteen minutes per game. With Taylor Hall out of the lineup, Zajac needs to be more responsible defensively but still accumulate the points. Joakim Nordstrom will play on the Bruins’ fourth-line tonight, but the Swedish forward has not scored a point in twenty consecutive games and finished the entire month of February pointless. Nordstrom has 2-5-7 numbers on the year, but both he and the Bruins expect more from him as the playoff push becomes more and more nerve-racking. Nico Hischier was the 1st Overall Pick in the 2017 NHL Entry Draft, but the 21-year-old forward has not scored a goal in the last seven games, only producing two assists in that time span as well. Hischier is being relied on by the Devils to score points without Hall, but he too is having troubles doing so. However, he is only eight points away from tying his numbers from last season – his debut NHL year. The last time these two teams played one another, the Devils beat the Bruins in the TD Garden by a final score of 5-2 back on December 27th. It was a very poor outing for the Bruins who just came back from their three-day Christmas break. The Bruins are a much better team from even December and will be looking to redeem that loss on home ice tonight. After this game, the two will play one final time on March 21st in New Jersey. The Bruins have the third-best power-play in the league at 26.5% going against the Devils’ third-best 83.7% penalty-kill percentage. On the flip side of things, The Devils have the 19th best man-advantage rate in the league (18.1%) going against Boston’s 81% penalty-kill success rate – good for 12th best in the National Hockey League. Below are the official warmup lines of the Bruins for tonight’s contest in TD Garden. With David Pastrnak expected to miss at least two weeks, it is now time for the Bruins’ secondary scoring to wake up. In last night’s game against the Chicago Blackhawks, it is clear that they took a step in the right direction. Danton Heinen has been fitting in perfectly with the first-line and is quickly silencing his critics. However, one must not forget that Jake DeBrusk also broke the ice last night. With him registering three points, it seems as though he is finally heading in the right direction to break out of his slump. "We're going to need contributions from everybody with Pasta going down for a bit. Heinen was unreal tonight, made a lot of big plays. Jake was very clutch as well…great games by them." One important factor to note is that once DeBrusk gets going, he has shown that he can play at a very effective level. After starting the year off in a similarly slow fashion, he ended up going on a stretch where he was scoring at will. With that being stated, there is no question that he has the ability to be a difference maker at the NHL level. With Pastrnak out, he is going to receive even more opportunities to shine. It is now time for him to play at a consistent level. This time of year is crucial when it comes to getting points. Although the Bruins are in a spot where the playoffs seem like a sure thing, history has shown that anything can happen in this league. Scoring from players like DeBrusk and Heinen are a necessity at this point in time. However, in a sense, there is an unsaid high level of expectations toward DeBrusk. He is a former first-rounder who has already shown in spurts that he can resemble an elite sniper in this league. It just is a matter of staying at that level permanently. The NHL Trade Deadline could also be massive for DeBrusk. There is no question that the Bruins are looking to acquire a top-six winger. Artemi Panarin has been the major name that the team is linked to, but it is not limited to just him. There are plenty of rentals who can slot on that line who could help DeBrusk’s offensive consistency blossom, such as Micheal Ferland and Wayne Simmonds. Bringing in a legitimate second-line winger would be the best action for not only DeBrusk but the entire team in general. Criticism has been handed DeBrusk’s way during his cold streak, and it is justifiable in a sense. There is no question that the team should expect their second-line winger to produce at a solid pace. At certain points, one may argue that he has looked invisible on the ice as well. However, at the same time, the line has struggled to find solid chemistry all season. When a team is constantly changing up lines, it can leave a negative impact. With him being a young player, it makes sense as to why this has occurred. At the end of the day, it is quite apparent that the importance of DeBrusk breaking this streak is at an immense level. The Bruins have the potential to do something special this postseason, but they need players like him to play their bests. At one point of the season, it seemed likely that DeBrusk easily could have had a 25-goal campaign. The potential is there, but more importantly, the consistency needs to be as well. Expect these last few months of the regular season to lead to him breaking out. Last night truly was the start of that. The 2019 NHL Trade Deadline is less than two weeks away and the anticipation of every fan in the National Hockey League is growing by the hour. Similar to every season, in the weeks and days leading up to the February 25th deadline, the trade rumors are through the roof. NHL insiders and analysts alike are scrambling to find the latest, most in-depth scoop on any team involving trade. For the past couple of seasons, especially this one, the Boston Bruins are one of the main teams in the mix to make a deal at or around the deadline. It is well known that the core of the Bruins – Patrice Bergeron, Brad Marchand, Zdeno Chara, Tuukka Rask, David Krejci, etc. – are not getting any younger and it would be a good send off for some of these players to get another Stanley Cup ring under their belts. In addition to that, the Bruins have some holes on their roster that need to be filled. Head Coach Bruce Cassidy has had an issue with the depth scoring since Opening Day back in October. In the two wins last weekend against the Los Angeles Kings and the Colorado Avalanche, Cassidy had star forward David Pastrnak on the second-line with Krejci and Cehlarik while Danton Heinen joined Bergeron and Marchand in an attempt to spread out the offence and spark offence on other lines than the top one. Heading into the Trade Deadline, Boston is quite clearly going to push for a top-six winger, most likely to play with David Krejci, so Pastrnak can be reunited with Bergeron and Marchand, if they do end up making that push. With a quote coming from an article published on NHL.com by Amalie Benjamin (@AmalieBenjamin on Twitter), General Manager Don Sweeney does indeed recognize that need. If the Boston Bruins want to be considered a Stanley Cup Contender this season or even just a really solid team coming out of the Eastern Conference, then Sweeney needs to pull the trigger and in my eyes – that is the move to make. Make a trade for a top-six winger who can score. However, even though I’d like to see a move made, I think for a few reasons that Boston will not make a big trade this Trade Deadline. High Risk – High Reward, Maybe. To make a trade, you have to send someone the other way – simple equation to all trades in every sport. The Boston Bruins appear to have a large pool of prospects in not only the AHL with the Providence Bruins, but across many different hockey leagues all throughout the world. With that said, the performance of these young players in the NHL this season may be a cause for concern for other General Managers on the other end of the phone call. Ryan Donato and Jakub Forsbacka Karlsson were arguably the best prospects in the system as we closed in on the 2018-19 season, but with their lackluster performance in the NHL, resulting in their demotion back to Providence, it is a very good chance that the GMs across the league are worried that these prospects are “flops”, which could be completely false, but it is most definitely something they are discussing. Columbus Blue Jackets forward Artemi Panarin is without a doubt, the number one player on the market. Boston Globe’s Matt Porter discussed what the idea of what Columbus may be wanting for the pending unrestricted free agent. “The market for (Panarin) is reportedly a first-round pick, a player, and a prospect. It is a high price, especially for someone who could leave a team empty-handed on July 1. But the Bruins are interested, and they’re not alone,” Porter reported. If I were a betting man, (I am not), I would imagine Jake DeBrusk having to go to Columbus as well as a Ryan Donato or Trent Frederic and the 2019 1st Round Pick. All that with the added dilemma on what happens to Panarin after the season ends, does he test free agency, or does he sign an extension in Boston? That is a high price for a rental player and it does not guarantee a Stanley Cup for Boston. Even if it isn’t Artemi, players such as Mark Stone, Wayne Simmonds, Michael Ferland, or Kevin Hayes – the Bruins will have to give up assets that may or may not appeal to the future of this franchise. It has been mentioned that it is a buyer’s market right now, but teams with valued assets will most likely charge an arm and a leg for that player because they can most likely get those same assets back from one of the other 30 NHL teams. Are the assets going out worth it? That is to be determined, but nothing is official. Even though GM Don Sweeney expressed his interest in trading, he also said in the same quote that he wants to avoid moving a large part of their future for a possible rental player. When saying that, he wants to avoid a repeat of last year’s deadline acquisition with the New York Rangers. Put in the same position as this year, the Bruins needed help on the top-six forward core. In what looks like now like a panic move, the Bruins sent forward Ryan Spooner, defenceman Ryan Lindgren, and Boston’s 2018 1st Round Pick (traded to Ottawa for D Jacob Bernard-Docker) to the New York Rangers for forward Rick Nash who played in eleven regular season games (3-3-6 totals) and another twelve playoff games (3-2-5 totals, -7 rating) and then retired this year. Sweeney moved a lot of youth – mainly Lindgren and that 1st Round Pick for a player that played in a combined twenty-three games in a Spoked-B sweater. Don Sweeney has stated in the past that he does not want to move another first-rounder and if it is for a player that may decide on hitting the free-agent market come July 1st, the chances of him giving in are quite slim. When considering that, there are teams, such as Toronto, Tampa Bay, Winnipeg, or Nashville that would gladly trade their first-round selection because they believe that they can be a serious Cup contender and that their pick will be a late round pick and in that regard, would not be that hard of a price to pay. Sweeney does not want to make a mistake on a trade nor make a move just for the idea of making a move, leaving some bargaining power off the table. One thing that a lot of the hypothetical trade targets have in common, is that their current contract expires on July 1st. If the Bruins management decides to make a move for one of these players, it does not guarantee that they will remain on the team for the 2019-20 season. That plus the fact that the B’s will have to trade some pieces, like I have already mentioned, that may not be in the plans of the future. Of course, there is no guarantee that any of these players make it to free agency and if they do decline offers from their respective teams, then there is no guarantee that they are swayed enough by the Bruins management members to come to Massachusetts and join the Bruins. However, the same can be true if the Bruins trade an arm and a leg for these players for them to just leave at the beginning of July. If Boston fails to win the Cup with them, then it is another bad move. If Sweeney and the Bruins make a move that will most likely have to require that first rounder, it makes a RFA offer less likely because Boston will be without a pick in the first round for three years in a row. The options for Sweeney are a lot, but the questions that are being asked often are the following. Can the Bruins afford to move the youth and prospects that they have built up for a rental? Will a trade for a longer-term player work out? Will the lack of 1st Round Pick(s) impact the team in a negative manner for the long-term? Should Boston make a real push with Chara, Bergeron, etc., getting older and their time for another Cup running slim? The questions continue from there but with the weeks and days counting down, only the B’s management know what they can get and what they want. We as fans just have to bite the fingernails off as we anticipate the breaking news, or lack thereof. In one final conclusion, I do not think that the Boston Bruins will make a big, franchise-altering trade at the Trade Deadline this season. If there will ever be a big trade, it will be at the NHL Entry Draft in Vancouver or on the opening day of NHL Free Agency. Don Sweeney’s track record has not been pleasant nor will the assets going the other way for a player that may or may not stay with Boston next season all combined together with the simple fact that nothing guarantees a Stanley Cup. What do you think about the 2019 NHL Trade Deadline? The Boston Bruins are back in action for another matinee game, the second one in two consecutive weekends. Boston is coming off of a shootout loss to the New York Rangers in a game where the team once had a 3-1 lead in the third period but allowed the Rangers to come back and win. The Bruins hold the first wild-card spot, two points behind Montreal with a game in hand. The Los Angeles Kings are in the middle of a three-game winning streak, all of which coming this week. The Kings have struggled this year, having a below-.500 winning rate, but are somehow only six points away from being in a playoff spot, so these wins are crucial for them to make a big push late. Bruce Cassidy announced that D Matt Grzelcyk is out with a lower-body injury and D John Moore is back in the lineup to replace him. After a touching, memorable ceremony to honour Patrice Bergeron reaching the 1000-game milestone, the Bruins and Kings went back-and-forth as I predicted in the pre-game preview. In the first seven minutes of this hockey game, there was no whistle. Boston was outshooting the Kings 5-0 during that time, but even then, the offensive seemed a bit slow and off. Right off of the first whistle, L.A. started to find their game. They started to cycle the puck around the Boston zone – getting a pair of shots on Rask. Forward Jake DeBrusk got too reckless with the stick while the Kings were controlling and he is sent to the box for two minutes for hooking. On the shorthanded play, Brad Marchand has a chance to get out of the zone and get a breakaway but is interfered by Alex Iafallo and the Bruins are to the power-play after nine seconds of 4-on-4. Los Angeles did a good job clearing the puck on the penalty-kill and preventing any good chances by the Bruins. The best chance for the B’s came in the dying seconds of the man-advantage, where McAvoy fired a shot, leaving a rebound open for Backes who failed to capitalize due to the magnet-like defence of the Kings. The Bruins and Kings continue the period at a very high-paced level. Boston seems to be getting the better of the chances and getting more quality shots on Jonathan Quick while the Kings have not had too many opportunities on Rask. The defensive side of the puck has been solid as well with 2.5 minutes to go in the first for the B’s. With just over a minute to go, David Krejci makes a sweet move and a nice pass to an open Peter Cehlarik but Quick dives across to make a big stop late. The Bruins have been getting better and better as this period goes on. All of their chances have been met by Quick. Looking good heading into the first intermission. Chances continue for the Bruins early in the second period as Krejci has an open net to shot at off a rebound, but the puck could not lay flat on the ice for him and no shot came from it. Right off that, a minute into the middle frame, Drew Doughty is sent to the box for delay of game. Los Angeles had another solid penalty-kill like they had in the first period, even getting some shots on Tuukka Rask while shorthanded. The Bruins could not generate much offence on the power-play, another poor effort on the man-advantage. Less than five minutes into the period, Danton Heinen made a nice pass across the zone to Patrice Bergeron who made an absolutely beautiful no-look feed to Charlie McAvoy cutting behind the play. McAvoy buries it past Quick into the open net for his second goal of the season. Assists go to Bergeron and Heinen. Great no-look pass by Patrice Bergeron sets up Charlie McAvoy's second goal of the season. Not long after the goal, Bruins captain Zdeno Chara would be caught at the blueline on an interference minor while trying to receive a pass from Brad Marchand. Bruins allowed one shot on the previous penalty-kill and they will go back shorthanded here. Kings had arguably the best power-play of either team on this one. Iafallo had one of the best chances on the man-advantage, taking a shot on Rask who was moving side-to-side but Rask makes a brilliant blocker save. Once the penalty was successfully killed off, David Krejci is called on a slashing penalty and the Bruins are right back at a 5-on-4 deficit. LA is starting to get more confident while rushing into the zone. Give too many chances and eventually, they will score. Alex Iafallo on virtually the same shot as on the last penalty fires a one-timer through Rask and it is a tied game. Iafallo’s eleventh goal on the season and gets back at Tuukka for the big save earlier in the frame. Assists go to Martinez and Kempe. Even though the Kings tied it, the Bruins off the hands of their top line came right back with some good zone control. For a few minutes, it looked like a power-play for the B’s. Clean passes, shots on net, and nice job cycling the puck. No goals came from the zone time, but it was a good look for the team considering the goal against. With six minutes to go in the period, the Bruins fail to get the puck out of the zone, lose coverage on Anze Kopitar who fires a shot past Rask and just like that, the Kings are leading 2-1. Assists go to Dustin Brown and Dion Phaneuf. Brown’s assist was his 599th career NHL point. Defenceman John Moore had to go off with around four minutes left to go in the frame after taking a wrist shot off of the visor, appearing to cut his nose. If he is not wearing a visor, that is a much more dangerous situation than what it is. Moore did return to the bench a few minutes later. The poor passing of the Bruins – especially on the breakout passes continue. A turnover in the neutral zone leads to Brandon Carlo tripping Iafallo as he entered the zone. Bruins to yet another penalty-kill. Los Angeles had three shots but the B’s do make a successful kill on the Carlo minor – ending the period for both teams at a 2-1 LA lead. The tides changed after a solid first period for Boston, the shots were 16-7 in favour of the Kings in the second. Things need to change if the Bruins want even a point in this one. The opening minutes were quite close between the two teams, with the first line continuing the solid play. Danton Heinen has found success this game with great forecheck alongside Bergeron and Marchand and he would be rewarded with a goal less than four minutes in. McAvoy fired a shot and Heinen was there for the rebound. That’s three points in two games for Danton and his eighth goal of the 2018-19 season. Assists to McAvoy and Marchand. A minute-and-a-half later and the Bruins strike again. Torey Krug’s shot bounces directly to David Krejci who fires it past Quick and early, the Bruins have a 3-2 lead in this hockey game. Right after the goal though, Chris Wagner is headed to the box for tripping Ilya Kovalchuk and Boston is once again to the penalty-kill. The penalty-kill was going well for the B’s, holding off any really good chances by Los Angeles. Then, Patrice Bergeron and Brad Marchand find themselves on a shorthanded 2-on-1, where Marchand buried the goal past Quick. The shorthanded tally was Marchand’s 24th of his career, tying him with Derek Sanderson for the second-most shorthanded goals in Boston Bruins franchise history. Even with the three goals early in this period, the Bruins still have struggles getting the puck out of the zone – a trend that has been hurting the Bruins this game and comes back to do it again. Kevan Miller’s clear is picked off and Brandon Leipsic makes a slick pass to Nate Thompson, the former Bruin, who beats Tuukka Rask and around the halfway mark of the period, it is a one-goal game again. LA has been putting on pressure like they have at numerous times throughout this game, but the Bruins manage to hold off any goals and get the puck out of the zone. Missed opportunity for the Kings not to score on a lengthy zone chance like that. With 5:14 to go in the final regulation period, Derek Forbert finds a sneaking Carl Hagelin who is open backdoor but Rask sees him coming and slides over to make the saves. The chances are piling up for Los Angeles after nearly six minutes of play without a whistle. Like I said earlier, give enough chances, and they will score. With 4:47 to go in the game, Oscar Fantenberg rips a bomb at the point from a Doughty pass and goes top shelf. Tuukka Rask does not see the puck until it hits the mesh – we are tied at four. Each team had valiant efforts in the dying minutes of the third, but it heads to 3-on-3 overtime. This game should be over and we can look ahead to the Avalanche tomorrow. Boston cannot seem to hold any sort of lead for long, even when they score three goals in the first ten minutes. Los Angeles gets the first really good chance of the always-exciting overtime session as Adrian Kempe gets alone on a breakaway but Tuukka Rask stones Kempe with the blocker. David Krejci made the bad pass that led to the chance but Rask did his job well. With 3:33 remaining in overtime, Ilya Kovalchuk sticks his stick out, catching David Pastrnak’s skates – sending the Bruins to a 4-on-3 power-play in overtime. Brilliant chance here for Boston to strike and win the game. And win is what they would do. Torey Krug finds Bergeron on the other side of the ice, Bergeron waits and fires a picture-perfect shot off of the post and in and the Bruins win 5-4 in overtime. Bergeron gets the game-winning goal, the third-most game-winning goals in Boston Bruins history. Boston takes on the Colorado Avalanche tomorrow in the TD Garden. On Saturday, February 9th, Boston Bruins Head Coach Bruce Cassidy will be the main man on the B’s bench for his 164th game – exactly two full 82-game seasons. Recently, individuals around the fan base have been questioning the work of Cassidy and whether or not he is the right head coach for the team moving forward in the years and seasons to come. In the shootout loss to the New York Rangers, Cassidy chose not to put forward Patrice Bergeron in the player-vs-goalie period, once again bringing up the judgement on his decisions. Then there is the David Pastrnak situation. The Bruins are very much a front-loaded roster when it comes to the offence. Aside from the first line of Marchand, Bergeron, and Pastrnak, the Bruins do not have much to fall back on when we are talking bottom-nine scoring forwards. David Krejci can put up numbers but always seems to be lacking good wingers at all times. Jake DeBrusk has more recently brought some life to the second line, but a hole remains on the right wing. During the fast-paced action of a game, Cassidy may put Pastrnak with his fellow countryman, David Krejci and Canadian Jake DeBrusk to “spread out” the offensive firepower. However, not before long, the trio that is a true threat to any team in the NHL is back together and a large pool of centres and wingers are placed alongside Krejci to try and find that seemingly-rare chemistry. We have yet to see multiple games of consistent Krejci-Pastrnak action unless it is on the power-play which, coincidence or not, is one of Boston’s strongest weapons of scoring opportunities. Krejci and Pastrnak have proven in the past that they can find that chemistry that has been discussed before on many occasions and build some good chances to put the puck past the goal line and into the back of the net. Although, once they are on together, it brings along a weaker first line, where Marchand and Bergeron lose a highly-skilled scoring player who can make things happen on the ice. Recently in an interview prior to the Kings game on Saturday, Cassidy said that they are going to try out Danton Heinen on that top line. Heinen is not Pastrnak by any stretch of the imagination and has struggled this season after a strong rookie campaign in 2017-18. Cassidy did go on to say that Heinen is more a defensive player and the three of them will not have to worry too much about the top lines of other teams because all of them, especially Patrice Bergeron, are for the most part, responsible defensively. The lack of depth scoring on the Boston Bruins in February 2019 can also be attributed to the lack of trades by General Manager Don Sweeney and with only a few more weeks until the NHL Trade Deadline at the end of the month, the clock is ticking to make that deal for another scoring player to play on the front end and bring some help to the top-six. Either way, Bruce Cassidy has done well and continues to do well. In the past few games, the only line that has been reliable offensively has been that first line. In the three games of February so far, Marchand, Bergeron, and Pastrnak have a combined eleven points. After them, David Krejci has two points, Danton Heinen, Jake DeBrusk, and Peter Cehlarik have one, and the rest of the forwards are yet to score a single point in three games. Dating back to January 1st, the dangerous first line has fifty-three points combined (22 Goals, 31 Assists) with Brad Marchand (7-13-20) leading the way in those 15 games. Only David Krejci has double-digits in points for 2019 and Jake DeBrusk is the next highest with only five points in fifteen games. It does not make the job of Cassidy any easier when they do not have a high quantity of quality players. Look at the Toronto Maple Leafs or the Tampa Bay Lightning for examples. Both teams have many interchangeable parts on all four lines. Almost every forward on the roster can play on the first line with success and the team will most likely still win games. Do goaltending and defence play a large factor in that as well? One-hundred percent. But the flexibility of those four forward lines makes the job of Mike Babcock on Toronto or Jon Cooper on Tampa Bay a lot easier. Just like the blame cannot be placed on individuals for a team effort, the blame cannot be solely placed on Cassidy for the position the Bruins are in. On April 26th, 2017, the Bruins named Cassidy head coach of the team – replacing long-time coach, Claude Julien who was fired earlier in the year. Cassidy coached twenty-seven games for the Bruins, finishing with an 18-8-1 record and leading them to a first-round playoff matchup with the Ottawa Senators in the 2016-17 season, a series that they lost in six games. This led into last season, where Cassidy implemented his faith and passion for the young players of this league, helping lead the B’s to a 50-win season. Bruce was right behind the team for their first-round win over Toronto and stuck by them in the five-game loss to the Lightning. The year for Bruce led to him being one of the three nominees for the Jack Adams Award – awarding the best coach in the NHL for that season. While he didn’t take the award home, the honour of being nominated for it is a great accomplishment. Again this year, Cassidy has done a great job. It has been a difficult road to manage the struggling youth that once succeeded for him not only in Providence but in Boston during 2017-18 as well, the goaltending challenges of Rask and Halak, and the whole offensive situation that I’ve discussed over. With the older players such as Chara, Bergeron, Krejci, Marchand, and Backes, being surrounded by the younger players such as Pastrnak, DeBrusk, McAvoy, Carlo, and Heinen, Cassidy has had a challenge of who to play with who at what time and when. For a team that seems to have rough nights, still battles back and is able to fight their way to earn a point or at the very least, remain competitive in the ever-so-difficult Eastern Conference. Bruce Cassidy has a 97-45-21 record with the Boston Bruins since 2016-17. According to BostonGlobe.com’s Kevin Paul Dupont (@GlobeKPD on Twitter), Claude Julien, the man who won the Stanley Cup with Boston in 2011, had a 94-48-22 in his first 164 career games with the Black N’ Gold. Cassidy, 96-45-20 (.658) will close out 164 games (two full seasons) on Sat vs. LA. Julien's first two years in BOS: 94-82-22 (.640). Julien and Cassidy are almost identical in their wins/losses and they have started almost a decade apart from each other (’07/’08 debut for CJ, ’16/’17 debut for BC). Bruce Cassidy is not only a good coach, but he should remain a coach for the Boston Bruins. He has had success and will continue to have success if the right players are on his lineup. Does he make mistakes time in and time out? Of course, not many coaches in any sport are perfect, (unless you’re Bill Belichick on New England) and it is how he can rally behind the team after a loss and turn it into a win. Bruce Cassidy can do that with the best of them. After taking a look at every trade by Bruins GM Don Sweeney, we now dive into his draft history. We begin with his first and most controversy draft, the 2015 NHL Entry Draft. In grading the picks, I’ll look at: where they were projected to go, what they have done so far, what players before and after have done so far, their fit to the Bruins at the time, among other aspects. These grades can easily change in a years time, some prospects take longer to groom before being. This entire grading as a whole is still way too early, you can really only grade a draft a decade down the line and see what impact (or lack thereof) the players have made. It was well documented that the Bruins wanted to flip a couple of picks and move up in the draft to select the slick two-way defender Noah Hanifin. Obviously, they weren’t able to do that, and the Bruins also ended up missing out on similar D in Ivan Provorov and Zach Werenski to take the rains from Chara. Rather than go for a more offensive guy in Thomas Chabot (hindsight is 20/20) the Bruins ended up picking a more reliable, hard-working defenseman in Zboril. The young Czech D has slowly been developing in the AHL and has grown both offensively and defensively. While he didn’t play much (averaging 10:56 in his two games), he didn’t look out of place in his brief stint with the big club. He’ll carve a role the NHL at some point, there’s no questioning that, it’s just a matter of when and where. Already a fan favorite in just his second season with Boston, Debrusk has been exactly what the Bruins’ management wanted him to be. The 22-year-old shows his work ethic every single shift he’s on the ice and is really starting to develop into a big goal scorer. If he wasn’t injured earlier on, he had a very good shot of hitting the 30 goal mark on the season. You can compare him to guys like Matthew Barzal or Brock Boeser who were drafted behind him, but Debrusk had embodied what it means to be a Bruin from the get-go. I like Senyshyn a lot. Despite being behind in development compared to some of his fellow draftees, he’s the type of player that the Bruins need. He’s got great speed, solid size, and being a right shot power-forward, it’s exactly the kind of player that would look great on the right side of David Krejci. My biggest problem with this pick is that the Bruins didn’t trade down in the 1st round to get him. Because he was projected to go early to mid 2nd round, you would think that if the Bruins wanted the player so badly, they could’ve moved down in the draft with one of these picks similar to what Toronto did in trading their 1st rounder (24th overall) to the Flyers for a 1st rounder (29th overall) and a 2nd rounder (61st overall). With all of the talent in the 1st round, there were bound to be other teams with the wish to move up in the draft to select a guy like Matthew Barzal or Kyle Connor. I have no problem with the player, I think at some point he will certainly become a consistent middle-six forward, but if Sweeney managed his assets a little better, maybe they come out of the draft with another talented prospect along with Senyshyn. The Bruins hit a home-run with this pick. After playing just seven games in the AHL in the previous season, Carlo made the jump to full-time NHLer in 2016 as a 19-year-old. He played the entire 82 game season but definitely looked shaky at times. Since then, Carlo has really started to carve out a role on the Bruins back-end. I think he’s the Bruin that has improved the most since last season. He’s been an outstanding penalty killer and overall great shutdown defenseman while adding a lot more grit to his game. If Carlo could work on his offensive skills a bit more (just three points in 41 games this year), I can see him on the top pair for the Bruins for many years to come. Now while calling him “Patrice Bergeron 2.0” is a bit far-fetched at this point in his career, there’s no doubt that the young Swede has the skill-set to be a full-time NHLer. We’ve seen flashes of brilliance both offensively and defensively in his 28 games with the Bruins, but the consistency just isn’t quite there yet. At times, JFK looks a bit lackadaisical and not giving his full effort, but if he can work out his quirks, his two-way prowess will allow him to be a very good NHL player. With the ridiculous amount of injuries the Bruins’ D-core had, we got to see a lot of Lauzon in the NHL. He looked very comfortable in his 15 games in the NHL, there was nothing not to like. His 6’1, 205 lbs frame, combined with his puck-moving ability, makes him a two-way threat from the back-end. I’d say he deserves to be a regular NHLer next season, although he’s is unlikely to be that with the amount of depth the Bruins already have on D.
Goalies are always hard to judge after they’re drafted. So many of them are busts, but so many of them are late bloomers. Only two goalies (Mackenzie Blackwood and Adin Hill) have seen an NHL game from the entire draft. Vladar has been solid in the AHL but not outstanding. I’d expect him to challenge for the Bruins backup goalie position after Jaroslav Halak’s contract expires but the 6’5 Czech-man will have to wait a while until he gets his shot with the Bruins. Gabrielle is a very confusing player. After the Bruins drafted him in 2015, he went on to have two very good seasons in the WHL, lighting the lamp a total of 75 times in those two seasons. He’s got a bit of snarl to his game and some silky hands, but it just hasn’t clicked for Gabrielle in his pro career as of now. This year, he has a -22 rating in the ECHL and hasn’t even been given a look in the AHL. I’m not ready to call the player a bust just yet because he’s still just 21 years old, but something needs to change, whether it’s mentally or physically, if he wants a shot at making the NHL. A really good find late in the draft by the Bruins. After a so-so draft year at the University of Wisconsin, he progressed very nicely, upping his goal total each following season and eventually being named “captain” in his senior year in the NCAA. He’s continued on this path and has been a really solid player in the AHL this year, totaling 10 goals and 25 points in 45 games. Now the chances of a 7th rounder making the NHL are slim, but there’s actually quite a bit to like with Becker. Now at the University of Michigan, Becker has had a decent year with 10 points in 25 games. He plays the game hard, but the best thing about Becker is his size. He’s 6’3, and with that frame, I won’t be surprised if he’s able to challenge for a bottom 6 role in the NHL at some point down the line. So even with the controversial 1st round, there’s no questioning that the Bruins came out of this draft with a lot of talent. Many of the players have already sniffed the NHL and have very good chances to be everyday players with the Bruins. Sweeney’s average grade on this draft is just under a B- which is fairly accurate in looking at this draft. I do want to say again that these draft picks really can’t be properly judged until many, many years down the line but it was a fun thing to do as I’m continuing grading Don Sweeney’s tenure with the Bruins so far. Off the hands of the All-Star Weekend in San Jose, the Boston Bruins have announced some roster moves ahead of their game against the Winnipeg Jets on Tuesday, January 29th. In addition to some forward breaking news that can be found on blackngoldhockey.com, the Bruins announced today that goaltender Tuukka Rask has been placed on injured reserve retroactive to January 19th and goaltender Zane McIntyre has been called up from the AHL’s Providence Bruins. Tuukka Rask has been placed on IR retro to Jan. 19. He won't play Tues. vs. Jets. Trent Frederic, Peter Cehlarik, & Zane McIntyre (emergency basis) have been recalled from @AHLBruins. Ryan Donato & JFK have been assigned to Providence. In the final game before the nine-day break, goaltender Tuukka Rask was involved in a scary collision with New York Rangers forward Filip Chytil, resulting in Rask leaving the game with what appeared to be a concussion. Jaroslav Halak replaced Rask in the game and the Bruins went on to lose 3-2 the final score. The extended break for the Bruins may have been the best thing possible for Rask and the organization. It has been confirmed today that Rask has indeed suffered a concussion from the collision and in today’s NHL, concussions are taken quite seriously as they should be. The time off has allowed the Bruins doctors and trainers to properly diagnose Rask and Rask has not had to miss any games in the meantime. While the Bruins have ruled Rask out of the game against the Winnipeg Jets tomorrow, they have not ruled out a possible return for Thursday’s game against the Philadelphia Flyers. The retroactive injured reserve placement means Rask can return to the Bruins lineup whenever he feels that he is ready. To replace him against the Jets, Boston has called up goalie Zane McIntyre on an emergency basis. McIntyre has played in twenty-seven games with the Providence Bruins, compiling a record of 16-8-3 with a goals-against-average of 2.74 and a save percentage of .887%. The 165th overall selection in the 2010 NHL Entry Draft by the Bruins has made eight NHL appearances, going 0-4-1 in that time span along with a 3.93 goals-against-average and a .858 save percentage. In my opinion, Boston will go with Halak against the Jets, as he is the better goaltender and has done well this season. McIntrye will most likely serve as a backup goaltender for the inevitable future but the possibility is there for him to get his first National Hockey League start in goal in the 2018-19 season. Returning from the All-Star festivities, it is now crunch time for the B’s as we enter the final stretch of the ’18/’19 regular season. Boston currently sits in the first wild-card position, two points behind the Montreal Canadiens for third place in the Atlantic Division, but the Bruins do have two games in hand. Boston also has a five-point lead on the Buffalo Sabres who are the best team that is currently outside of the playoffs. Every game from this point on has its consequences and the healthy return of Tuukka Rask is needed to make that push for the post-season. The Providence Bruins announced today, January 3rd, 2018, that forward Ryan Fitzgerald has been named to the 2019 AHL All-Star Classic on January 27-28, 2019 in Springfield, Massachusetts. Ryan Fitzgerald is in the middle of arguably his best season while in the American Hockey League. The 24-year-old North Reading, Massachusetts native has 7-19-26 totals in thirty-four games this season, leading all Providence Bruins players in assists and points. His seven goals on the year rank him fourth on the team for goals as well. Before Fitzgerald joined Providence in the 2016-17 season, he played in four consecutive seasons in the NCAA with Boston College. In his 152 career NCAA contests, Ryan tallied 66 goals, 66 assists for 132 points. Fitzgerald’s best season came back in 2015-2016 where he scored forty-seven points (24 goals, 23 assists) in only 40 games played. Fitzgerald was drafted by the Bruins in the 4th Round (120th Overall) in the 2013 NHL Entry Draft and was signed to a two-year entry-level contract in the Spring of 2017. The Bruins management liked his play with Boston College, deciding to sign him to that deal that allowed him to play in the AHL, where he has been for the past two seasons. As fellow Black N’ Gold writer, Tim Richardson said in his Prospect Profile on Fitzgerald, the 5-foot-9 forward was expected to go in the second-round in 2013. Heading into his draft, Fitzgerald was that two-way player that almost every team would like to have in their centre core. He possessed good hockey IQ and defensive awareness on the ice but could also pitch in offensive such as he has done with Providence this season. Entering his first All-Star game, Fitzgerald has an entire family of hockey players. Father Tom Fitzgerald played in 1097 career National Hockey League games, seventy-one of which with the Boston Bruins back in 2005-06. NHL forwards Jimmy and Kevin Kayes as well as Matthew and ex-NHLer Keith Tkachuk are Fitzgerald’s cousins according to Elite Prospects. Many people in the Boston Bruins fanbase have urged management to try Fitzgerald in the NHL if (when) another injury hits the Bruins forward core. Fitzgerald seems to be more responsible defensively compared to some of the Bruins already on the roster and yet, he can still score goals and make plays as mentioned already. Do you think that Ryan Fitzgerald should get a shot with the NHL Bruins at some point this season if an injury comes up again? Check out the available tickets from our advertising partner SeatGiant for your next Boston Bruins game. Click the link below and when purchasing any event ticket, from the NHL, NBA, MLB, NFL to concerts and shows, please use discount code BNGP to save a little money. Thank You & Happy New Year!